Welcome to Bootstrapped Web, Episode 90. Today’s episode is our weekly update. Brian is still in North Carolina and has just launched the Content Upgrades Plugin. It’s officially out the door and as of this podcast’s publication it will be available to the public. He’s still working on the domain for the plugin. Right now, contentupgrades.io is working but they just set up shop.audienceops.com where it will eventually be sold from. It’s the first in a long list of plugins to come. In the last couple of weeks he had to set up the shop, promote, hold a webinar, and finally launch. About 350 people registered for the webinar and about 80 attended live which was a pretty good turnout. There’s so much that goes into a webinar, but overall it went well. The next step is to set up a more automated funnel. He’ll be using blog posts, a pdf download, a recorded version of the workshop all put together into an automated drip to drive sales. Before he leaves NC, he wants to put together the primary lead magnet on Audience Ops which will be an email course. First we’ll use it internally, then launch it as a plug in. He’s also working on a landing page plug in. If you already have a website and you’re already set up on wordpress, it’s not so easy to just whip up a landing page. Brian wanted a plug in that made it easy to set up a landing page that looked like the rest of the site – sort of an opt in page – a totally stripped down page that has your logo, your theme and some opt in information, rather than the just another page on the site. There are different versions of how to organize content and automation and different people do it in different ways. Brian will be travelling throughout the majority of December. The team is gelling and working well together and he no longer needs to be involved in every step of the process. He can focus on building out new parts of the product, sales calls and growing the business. Jordan is still entrenched in the day to day of Carthook, preventing him from the work he feels he should be doing. He’s got a lot of trials going on, he’s averaging more than one launch per day which is great, and everything’s heading in the right direction, but he has been buried. At the end of the day when he takes stock of his day there was a lot of activity but he didn’t spend time on the strategic work that needs to be done. It’s ‘death by a thousand cuts”. Brian’s suggestion is to add a tier 1 admin to help with these types of tasks. If you can train a support person, it might even give your new customers peace of mind. 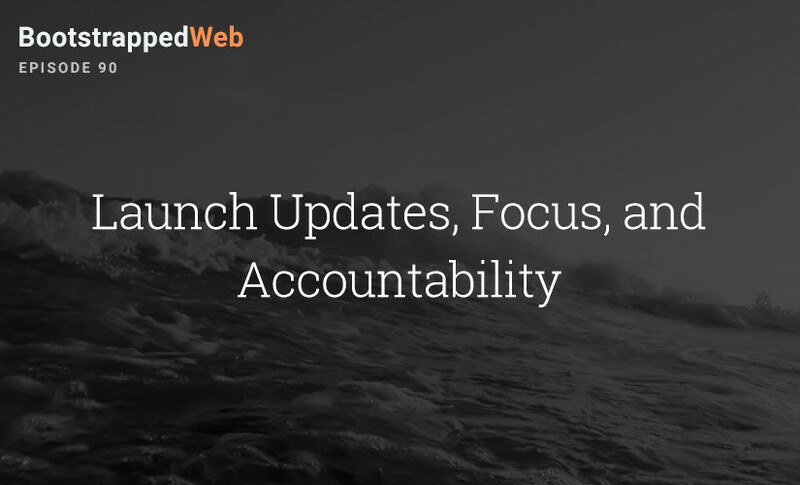 He’s using accountability – blocking off time to do strategic work, getting the work done and sharing status updates so that he’s accountable. It’s important for everyone to know what’s getting done to not overwhelm and to ensure that everyone knows everyone is working. It’s also important that he satisfies those who need his input but at the end of the day also satisfies his own objectives and goals. He had to create the space he needed, put aside some of the daily details, and focus on strategic planning. Responding to someone five days later is unreasonable, but so is expecting someone to respond in a hour. In the next episode Brian and Jordan will be talking about the ‘Target Market”. 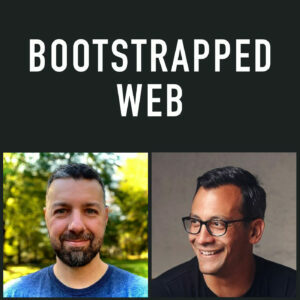 If you enjoyed today’s show, please give us a five-star review and we’ll mention your handle on a future episode of the Bootstrapped Web Podcast. Head here to leave a review in iTunes. Welcome to Bootstrapped Web Episode 75. First we want to thank David Lizerbran, and J-Fin for their recent reviews. Really appreciate the encouraging words and thanks for leaving us a review. 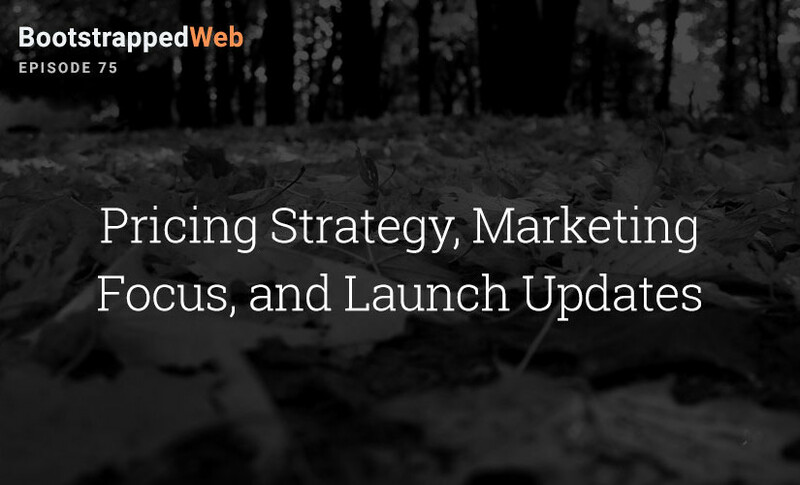 This week we’re catching up on recent developments in our businesses. Jordan has been in New York working with his co-founder Ben for the last week. This kind of in-person work together with your team is so powerful, and Jordan tries to do it once every few months at least. He also noticed how being in a city like New York brings out networking and connection opportunities even for online based businesses. Jordan has been deep in the marketing efforts of his business. Instead of straight outbound sales emails he has been doing outbound efforts to get potential customers onto a webinar they’re putting on about abandoned carts and ecommerce. This is adding an extra layer of value instead of just asking for customers to start a trial. Jordan is also starting a podcast surrounding Carthook which he’s sure will drive new inbound leads, and if he can engineer the launch right it will land in the New and Noteworthy section of iTunes. The last of Jordan’s updates is a change in pricing. From a variable pricing model based on recovered revenue now each customer is going to be charged a fixed price. This has been a bit of work but with clear expectations set with customers it has been going smoothly. Brian has been deep into getting Audience Ops off the ground and is about 4 weeks into it’s launch. They have 6 paying customers currently with 2 additional customers waiting to start in the coming weeks. The challenge thus far has not been sales and marketing, but scaling the production of supplying the materials to customers initially. This is quickly becoming standardized and is streamlining well. Aside from hiring writers to create the content of the articles and social media work Brian is in the process of hiring at least one Virtual Assistant and used Virtual Staff Finder to help select good candidates. These team members will be helping schedule WordPress posts, social media posts, and creating images that accompany those pieces. As if starting Audience Ops isn’t enough, Brian is also creating a WordPress plugin that will help people with customized content upgrades for posts. This will be available in both free and premium formats soon. The Productize course is also doing really well. May was the best month ever without a major promotion, likely the result of some marketing automation work Brian implemented a few months ago and are finally paying off. If you’re enjoying the show, head over to iTunes and leave us a 5-star review. Thanks!